Today, February the 2nd, we show you how to enjoy the Garden following the route. 2월2일 오늘은 화조원내를 즐겁게 놀수 있는 방법을 소개드리겠습니다. The first picture shows an area on the left just beyond the entrance of the Main Handling Zone. 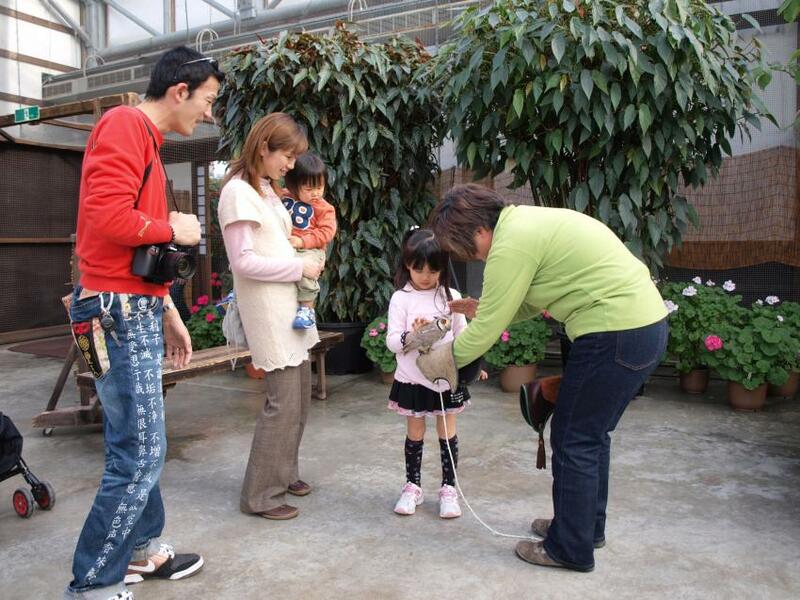 Owls are displayed here, and the Owl Handling service is held on 10:50, 13:20 and 15:20. After you have taken a picture with an owl on your hand, you can pat the owl gently on its back. On a weekend when this picture was taken, many families visited the Garden. 이 사진은 만남의 존에 들어선 입구의 바로 왼쪽입니다.여기에는 부엉이가 전시되여 있고 매일 10:50,13:20,15:20분에는 <부엉이를 팔에 얹혀보자>라는 이벤트가 진행됩니다.부엉이를 손에 얹혀서 사진을 찍은 후에는 또 이렇게 부엉이를 쓰다듬어 볼수도 있습니다.주말에 찍은 사진이라 이날은 한가족이 함께 놀러오신 손님이 많았습니다. Next, in the Water Lily Pools Zone, you can play with Sun Conures, Turacos, Grey Parrots and tropical Starlings. Many birds in the Garden are rather tame enough to sit on your arm or shoulder as they see you with food. 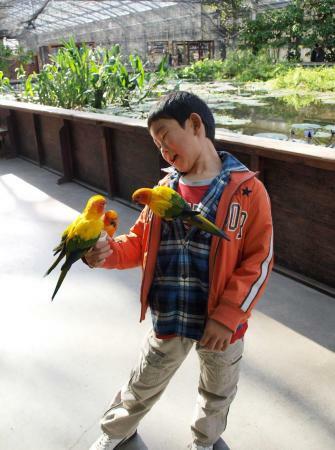 In this picture, a boy is handling Sun Conures. 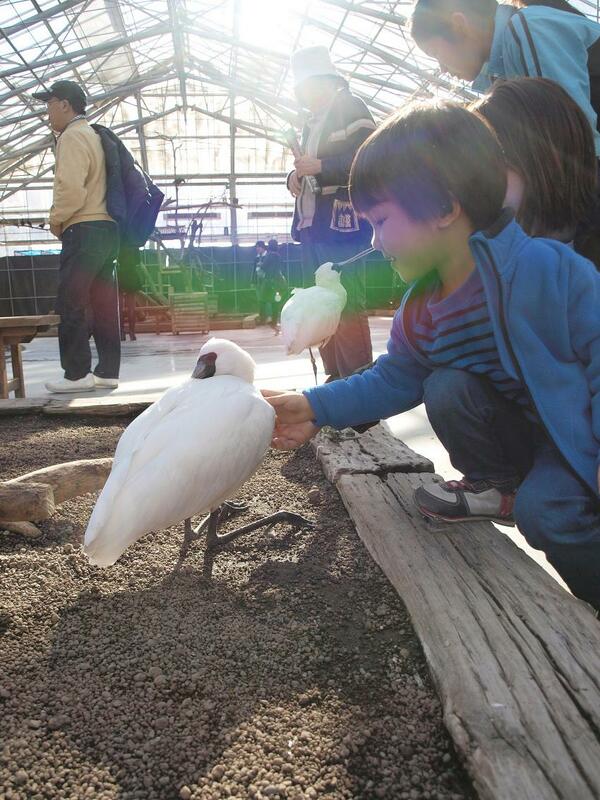 Tame birds do make you happy. 다음은 수련못에 들어가서 태양황금앵무,투라코회색앵무,찌르레기 등과 만날수 있습니다.당원의 새들은 애교가 많아서 먹이를 보면 어깨나 손에 날아와 앉습니다.마침 한 남자어린애가 태양황금앵무와 놀고 있었습니다.새들이 다가와서 이렇게 애교를 부리는데 즐거울수밖에 없겠죠? Next, you are in the Parrots Handling Zone beyond the Water Lily Pools Zone. You can see Parrots, Spoonbills, peafowls and newbie Aracaris. A boy in the picture was afraid of a spoonbill at first, but he soon got accustomed to it and touched it. 여기는 수련못존에서 앞으로 쭉 들어간 만남의 길입니다.여기에서는 앵무새외에도 저어새,공작새,그리고 들어온지 며칠안되는 중부리새도 있습니다.이 남자애는 첨은엔 좀 무서워했는데 조금 지나자 손을로 만질수 있게 되였습니다. I left the Parrots Handling Zone through the Main Handling Zone and went out of the Main Greenhouse. 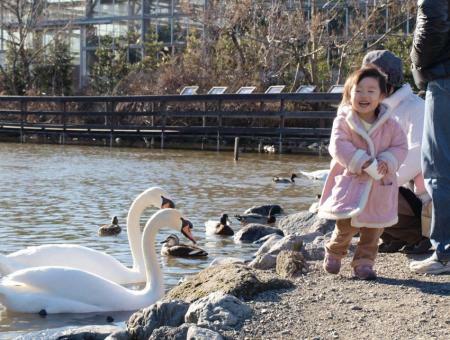 When I arrived near the outdoor Waterfowl Pond, a girl was feeding the ducks talking with them. The girl looked very content with full smile. 그리고 이번에는 만남의 길을 나와서 실외로 나가보았습니다.실외못에 도착했을때 여자어린에가 백조에게 인사를 하면서 먹이를 먹이고 있었습니다.먹이를 먹이고 난 그는 상당히 만족스러운듯 표정을 지었습니다. Out of the Greenhouse are the Emu Paddock and the Falconry Show Site. The flight show is taken place on 10:30, 13:00 and 15:00. 실외에는 또 에뮤목장,쇼장이 있는데 매일 10:30,13:00,15:00에 맹금류의 쇼가 진행되고 있습니다. If you get hungry after having fun with birds, you can enjoy lunch at the Buffet Restaurant under flowers. The restaurant accept entry from 11:00 to 14:30. 새들과 한껏 즐기고 난후 배가 꼬르륵 하면 온실내의 플라워레스토랑에 발음 옮겨보세요.카운터에서는 11:00시부터 14:30까지 접수를 합니다.이렇게 활짝 핀 꽃아래에서 에도시대로부터의 소야요리를 맛보는 것도 일종의 향수가 아닐까요. 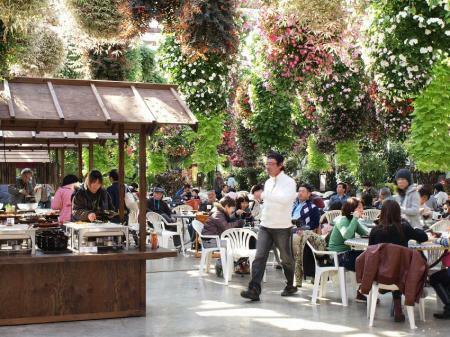 Cafeteria is by the restaurant, and the Garden provides you with coffee, icecream and some snacks there. 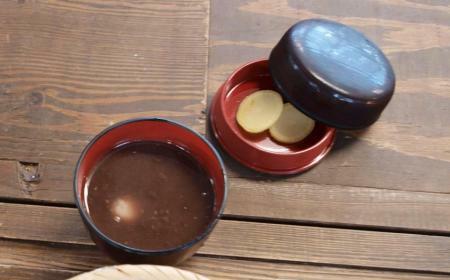 I tried a bowl of Oshiruko, azuki bean porridge. As I ate it with a spoon as Chinese usually do when they eat porridge or soup, one of my colleague was in wonder why I didn't use chopsticks as is always the case with Japanese. How interesting this kind of difference between cultures is! 저가락으로 먹기에는 습관이 안되죠.문화의 차이란 참 재밌다고 생각했습니다. 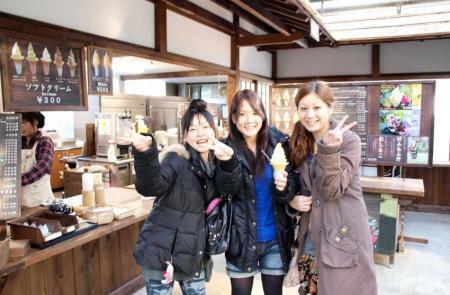 A shot of girls with icecreams they have just bought. The icecream we sell in the Garden is really tasty, rich in both amount and flavour. 마침 아이스크림을 사러 온 여자애들이 있어서 사진을 찍었습니다.여기의 아이스크림은 량도 많고 맛도 진하여 아주 맛있습니다.